Direction (1-5): Study the following information and answer the questions given. Eight actors I, T, F, O, E, D, L and K are sitting around a circular table. Three of them are facing outside the centre and other five are facing towards the center of the table. T is sitting to the third right of D. F is sitting to the third left of O, who sits second right of I and among F, O and I, one is facing opposite to the centre of the circle. Two actors are sitting between K and E and two are sitting between D and E. F is sitting to the second left of L, who is facing the centre of the circle. The person who is immediate left of F is facing towards the centre. O is not an immediate neighbour of K. E is not opposite to D and F.
Q1. Which of the following actors is facing to the opposite of the centre? Q2. Who is sitting third to the left of E? Q3.Who is sitting second to the left of O? Q4. Who is second right to L? Q5. How many people are sitting between K and O, counting in the anticlockwise direction from O? 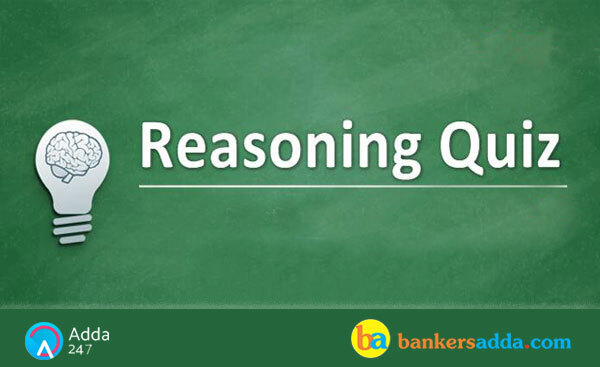 Directions (6–10): In each of the question below is given some statements followed by some conclusions. You have to take the given statements to be true even if they seem to be at variance from commonly known facts. Read all the conclusions and then decide which of the given conclusions logically does not follow from the given statements disregarding commonly known facts. I. Some Round are not Hands. II. Some Feet are Round. III. All round can be hands. IV. Some hands are brains. I. Some file are not plug. II. All Books are File is a possibility. III. All file being plug is a possibility. No Lamp is a Gun. I. At least some Gun are Lamp. II. Some Oil are Gun. III. Some Candle are not Lamp. I. No Nike is a Lion. II. All puma are not tiger. III. Some Tiger are not Reebok. IV. Some reebok are lion. II. Some black being bag is a possibility. III. Some Board are Black. IV. Some Board are not Skates. Directions (11-15): Study the information carefully and answers the questions given below. Six persons Z, Y, C, B, A, and W in a family have different weights. B is heavier than only three people. Y is heavier than only W. Z is not heaviest and his weight is 101 kg. The weight of A is 89 kg. Q11.Who among the following is the heaviest? Q12.What will be the possible weight of B? Q13. If the weight of the heaviest person is 115 kg then what will be the difference between the weights of C and Z? Directions (14): Study the following information carefully and answer the questions. Six persons N, M, L, K, J and A are playing a basketball match. Each of them has a different height. Each of them was born on a different month of the same year. The tallest is not the oldest. J is taller than only N but younger than L. M is taller than K and N. M is older than only J and A. N is younger than only K. J is older than A. K is taller than A. M is not the tallest. Q14. How many of them are older than J? Q15. In a race, Z, Y, X, W, V and U are among the top six Rank holders, not necessarily in the same order. Players are ranked in such a way that rank 1st is considered as the highest and rank 6th is considered as the lowest. X did not get the fourth rank. Z’s rank is higher than U’s and X’s rank but lower than Y’s rank. Four of them obtained lower rank than W and five of them obtained a higher rank than V. Who among the following obtained the fifth rank?